Enjoy an Aquarium in San Diego. Visit Scripps Birch Aquarium in La Jolla or Legoland SeaLife Aquarium in Carlsbad California. See some great marine life, or join in a fun adventure. There is something so magnificent about creatures under the sea, which makes a visit to an aquarium so special. 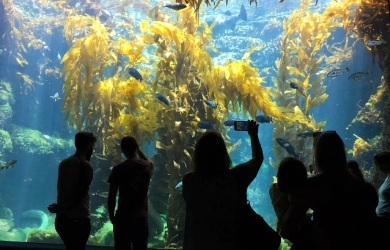 In San Diego we can enjoy seeing this sealife at three aquariums: Birch Aquarium at Scripps, SeaLife Aquarium at Legoland in Carlsbad, and in our San Diego waters too, such as La Jolla Bay off of La Jolla Shores beach, or the various tide pools in San Diego. All of these have different things to offer, but you are sure to have a great visit at an aquarium, and you don't have to worry about rain or tides. Come and enjoy! Birch Aquarium at Scripps in a premier aquarium in San Diego community of La Jolla, with stunning views of the Pacific Ocean and La Jolla. Learn about kelp, sharks, tidepools and much more. The aquarium is associated with UCSD and Scripps Institution of Oceanography. Scientists and naturalists from Scripps Aquarium offer additional programs for the public. Ticket Prices: $19.50 adults 18 – 59, Senior 60+ $16.50, UCSD College students or staff $16.00, Youth 3-17 $15.00. Discounts of $1 for AAA members, 25% for AARP members, $2 for military. Admission to Scripps Aquarium is also on the San Diego Go Card. For Scripps Birch Aquarium discounts and coupons see Discount Tickets and Coupons. Also check out the membership options. You may be able to join for a year and get free tickets for your family or guests, and save even more! Food: Enjoy outdoor lunch at the Splash Cafe, open M-F 11-2 and Sat-Sun 10 - 4. 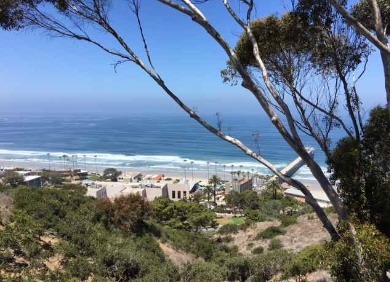 Or you can picnic on nearby Scripps Beach or La Jolla Shores Beach. 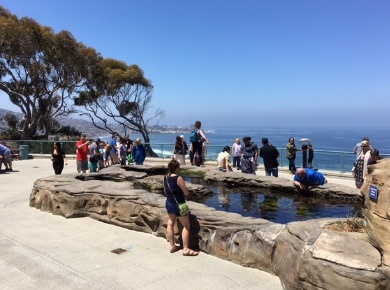 Birch Aquarium Directions: From Interstate 5 in La Jolla, go west on La Jolla Village Drive, continue straight onto N. Torrey Pines Rd, then a quick left on Expedition Way. Click on the link above to open the Google Map for Birch Aquarium and other attractions in San Diego and southern California. This SEA Days program is designed for all ages. Family Days merges Earth and ocean sciences with art and literacy themes by presenting unique programs that include hands-on activities, crafts, demonstrations, and interactions with researchers from Scripps Institution of Oceanography. Family Days is free with admission on the third Saturday of each month from 11 a.m.-3 p.m. Theme varies each month. For more information call 858-534-7336. Tidepooling Adventures - The season runs December through March. 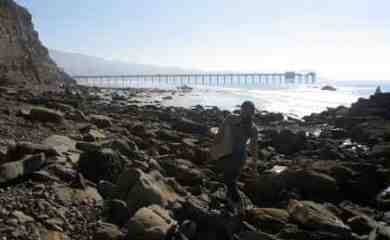 Visit local La Jolla Tidepools with a trained naturalist. Reservations required. For more information see Exploring La Jolla Tide Pools. Whale Watching The Whale Watching season runs late December - mid April. Go whale watching in San Diego with an ocean expert from Birch Aquarium at Scripps. Enjoy the view, listen to whale and dolphin sounds, and watch these fascinating whales. 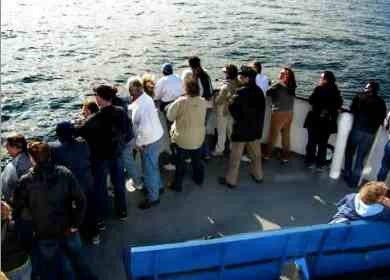 For more information see San Diego whale watching. Grunion Runs The Grunion Runs happen in the spring around midnight. A must-see adventure is the grunion runs on the beaches of La Jolla, where hundreds of silvery grunion fish ride the waves to shore to mate. They return to see while the eggs stay and hatch into baby grunion, to wash out with next high tide. $17 per person. Pre-purchase required: 858-534-7336. Snorkeling Adventures - Birch San Diego Aquarium offers Snorkel with Sharks snorkeling adventures during the summer months. Swim with schooling leopard sharks, garibaldi, smooth hound sharks and guitarfish while enjoying the mild surf and gently sloping beach of La Jolla Shores. See rays, flatfish, sand dwelling invertebrates and coastal sea life. Visit the SEA LIFE aquarium in Carlsbad, CA., next to Legoland California and the new Lego land Water Park. Young children will enjoy the touch pools with starfish, and seeing the sharks, stingrays and tropical fish. The Sea Life Aquarium also has interactive play zone and fun activities, and a new octopus garden. You may visit just the aquarium, or combine it with a visit to Legoland (and in the summer, the water park). Operating Hours: Daily from typically 10 - 5. Hours may vary. Food: No outside food and drinks are permitted in the park. Food is for sale, or you can picnic on the grassy area outside the entrance. SeaLife Aquarium Directions: – From Interstate 5 in Carlsbad CA (~20 miles north of San Diego), go east on Palomar Airport Rd., left on Armada Drive, then right on Legoland Drive. Click on the link above to open the Google Map for Legoland SeaLife Aquarium and other attractions in San Diego and southern California. If you enjoy the aquariums in San Diego, you might also enjoy visiting the San Diego tide pools. The tidepools are an opportunity to see sea life in a completely natural setting. Tidepools are best explored at low minus tides during the tidepooling season November - March. Check out the San Diego Tide Pools in San Diego, La Jolla, and North County.